Oatmeal dinner rolls are light and fluffy. Soft and mildly sweet. Easy to make, but taste like perfection. Say hello to your new favorite dinner roll. Add the oats and butter to a large heat proof bowl. Pour the boiling water over the oats and butter and allow to sit until room temperature. In a small bowl or cup, add the yeast to the 1/3 cup warm, not hot, water and stir gently. Add the yeast mixture, brown sugar and salt to the oats and stir gently. Knead in the flour one cup at a time. Knead the dough 6-8 minutes or until it becomes smooth and elastic. Place the dough in an oiled bowl and cover. Let the dough raise for one hour or until doubled. Punch the dough down and divide it into 24 equal pieces. 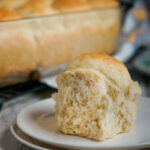 Shape into rolls and place in a greased 13x9 inch pan. Allow to rise again for 20-30 minutes. Preheat the oven to 350 degrees while the rolls are having their final rise. Bake at 350 for 20 to 25 minutes or until golden brown on top. This dough is somewhat sticky so I recommend using a stand mixer with a dough hook if you have one available.